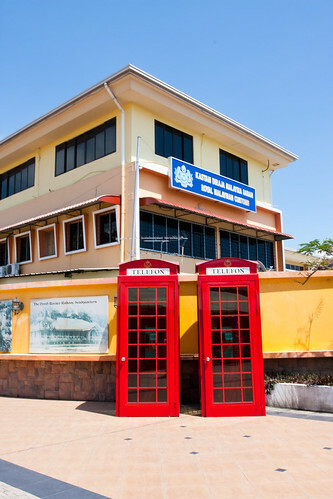 In Jesselton Point jetty, there were these red telephone booths which attracted quite a few ‘stares’. It’s kinda ‘weird’ to be there but heck, tourists were busy posing with them. I wasn’t sure whether they were in working condition or not but I guess they were. It was also that very moment, on the jetty, I realised that I’ll be suffering from sunburn by end of the day. My skin was warm and chilli red colour and I felt the burning sensation. But that didn’t hinder me from going to another location; the Atkinson Clock Tower, which was 15 minutes walk away from the jetty. Besides, it’s pretty much on the route back to my accommodation and so, I guess it was appropriate / alright to make a stop there. 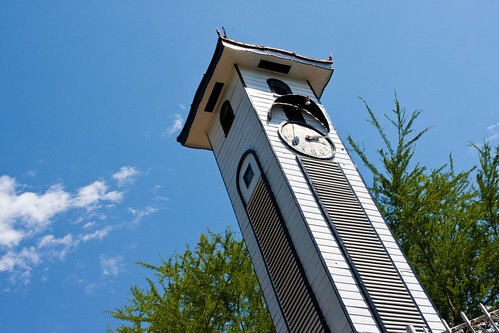 This Clock Tower has the distinction of being the oldest standing structure in the whole of Sabah that survived the destruction of Jesselton town during World War II. Till today, it still serves to keep the city’s time. One might give a miss as it wasn’t easy to find. 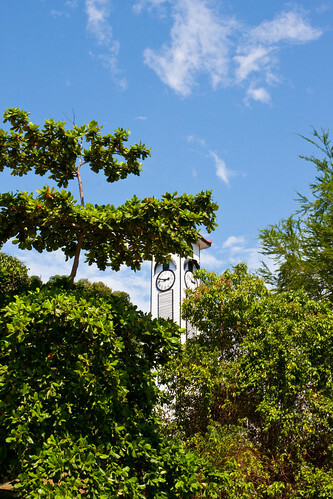 The clock was hiding behind some trees which made its visibility hard to detect. On top of that, it was pretty hard to get a good photo out of it. To some, they will feel the sentimental values while to the rest, it’s just an antique clock / object to them. My ‘journey’ didn’t end at Atkinson Clock Tower. Looking at the (tourist) map, there was another place to visit. This very place, which is said to be the highest point in the city, is called Signal Hill Observatory Platform. 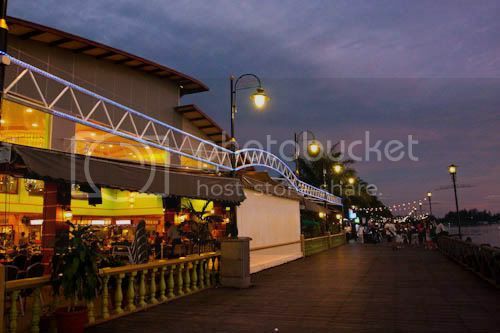 It is said that it provides a good view of Kota Kinabalu city centre. It was my very first lame attempt to shoot panoramic photo (click here for bigger view). Yeah, I know… nothing spectacular about it. As you can see, it’s pretty quiet around the city area. 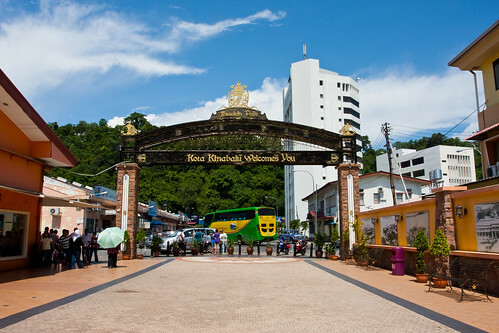 The buzz and all would be around tourist attraction area. I spent about 20 minutes or so before I packed up and headed back to have a good rest. A cold can of 100 plus and air-condition room were all I could think of when I walked my way down back to my accommodation. That’s how hot, thirsty, tired, and dehydrated I was. Since I was totally flat out, I remembered how reluctant I was and how difficult it was to drag my arse back out at about 6pm on the same day. However, no matter what circumstances they were, the thought of viewing the sun set was something one shouldn’t be missing out. Hence, I ‘crawled’ my way to the Waterfront again (note : you’ll hearing a lot of this place for the next few days). This time, I brought along my DSLR instead of my compact camera. I didn’t try any of the restaurants when I walked past them along the Waterfront. Not sure whether they were good or pricey, I decided to had my dinner in Warisan Square again. 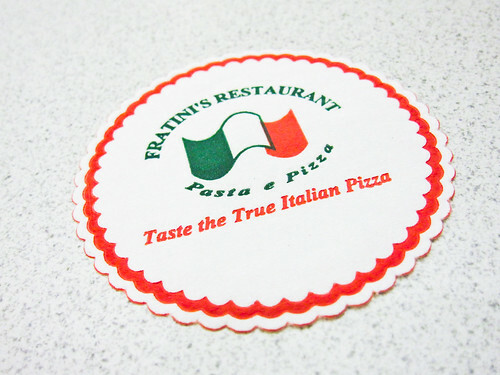 This time, it was an Italian restaurant which I am going to write about it soon. After the dinner, there weren’t much things to do and so, I headed back to rest.